Ubisoft is having some fun with a special event in For Honor on April Fools' Day 2019. Rabbids have invaded the game in this 24 hour mini-event going on in game. The event will run from April 1 at 12:00 AM ET and ends on April 2 at 12:00 AM ET. 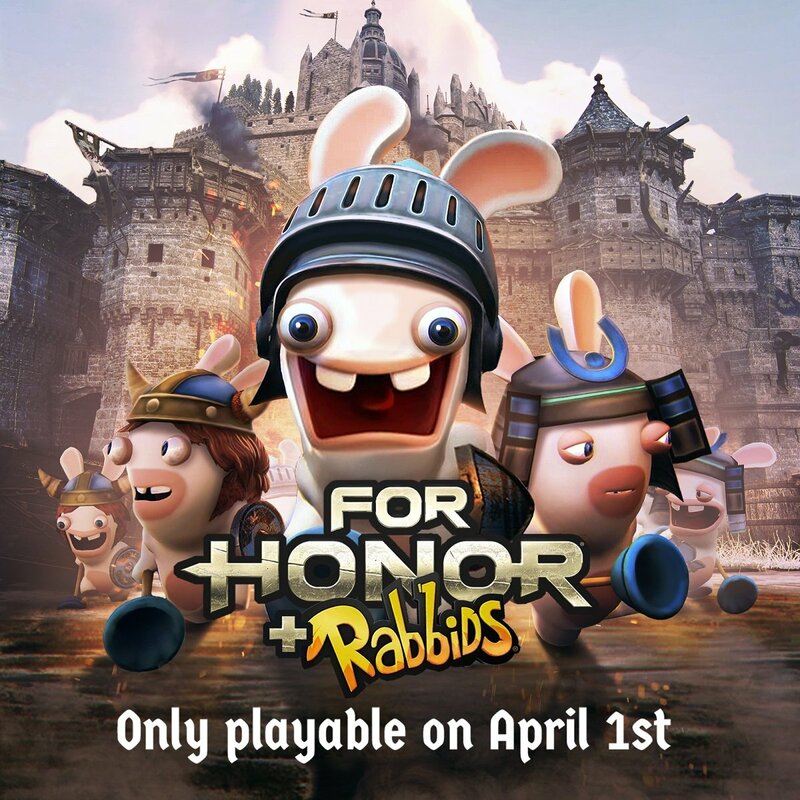 Those goofy Rabbids have invaded For Honor in this 24 hour long April Fools' Day special event. For Honor is in year 3, the Year of the Harbinger, which will continue to release content throughout 2019. There will be unique seasonal events occurring in-game all throughout the year. Today's Rabbid invasion is not an unprecedented crossover for these wacky Ubisoft characters, as they saw some success with the smash hit Mario+Rabbids Kingdom Battle for Nintendo Switch. This April Fools' Day mini-event is actually real and will be only playable for twenty-four hours, so get cracking if you want to participate in the silliness. For Honor's last special event, Return of the Otherworld, celebrated Halloween with loot and some tricks and treats to help players get spooky. Players who login to the game today will also receive a melee pack as an exclusive reward. For Honor has added a lot of content since its release, with Arcade Mode creating an endgame PvE experience to add value for players. In an interview with For Honor's creative director Roman Campos-Oriola told Shacknews that "In Arcade, you use the same character that you use in PvP. It's a shared progression. Arcade, it's made of quests, so the quest difficulty, it's linked to your gear. The higher your gear, the more difficult quests you can access. The quest is made of a series of encounters, so easier quests is four encounters, other quests it's up to six encounters. An encounter is randomly generated. It takes any map in the game, any enemies, and also it adds modifiers, either to the player or to the enemies, like more health, bleeding damage, or constantly on fire, which adds some pressure on the encounter." It is great to see Ubisoft continue to support the game, even if it is with a silly one day event featuring Rabbids. There will undoubtedly be more ridiculous April Fools' Day 2019 news today, so keep it locked on Shacknews as this day continues. 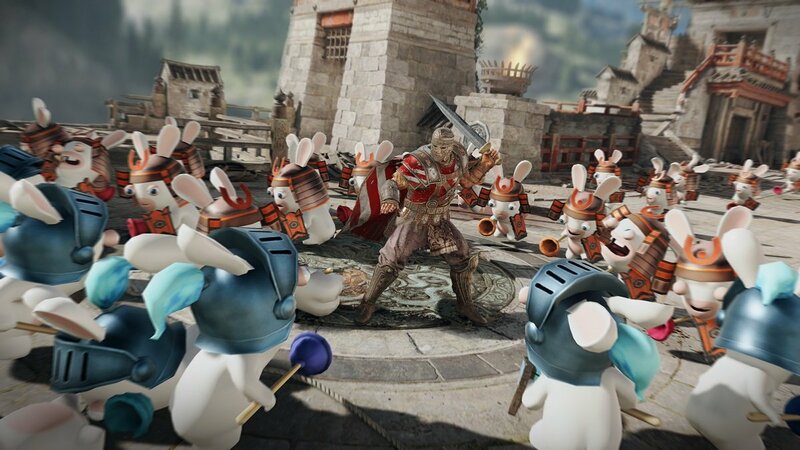 If they released a game that was just For Honor with Rabbids, I would be all over that. All games are improved by the addition of Rabbids. Change my mind. I believe this is an accurate statement. However I don't like any of the dedicated Rabbid games. I remember the first one (on the Wii) being a fun party game. I don't think I've played any of the subsequent games.